Nikon today announced Nikon D3200, The new Nikon D3200 features 24 MP sensor developed by Nikon, new image processing engine, better standard ISO range up to 6400 and now you get 60fps / 50fps speed during HD recording and 3 selectable frame rates 30,25, 24fps during Full HD recording with manual control over ISO and shutter speed. 2. Should I upgrade my entry level DSLR Nikon D3100 to D3200? Senor: Nikon D3200 features new sensor developed by Nikon, you get more megapixel and standard ISO range. Image Processor: The Nikon D3200 comes with the new Expeed 3 image processor, same image processor used in Nikon 1 system, D800 and D4 DSLR, with the help of new image processor you get 4fps speed @ 24.2 Megapixel compared to old Expeed 2 image processor where you get 3fps speed @ 14.2 Megapixel, improved frame rates during video recording and less noise in JPEGs that come straight out of the camera. 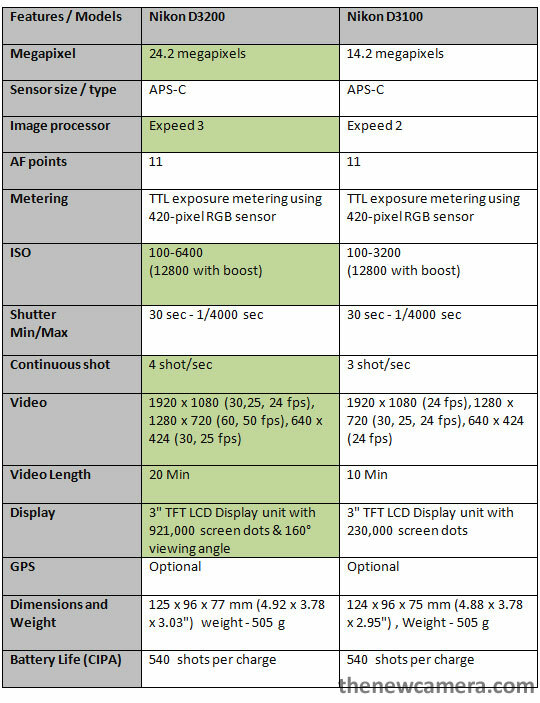 Auto Focus: Both Nikon D3200 and D3100 shares same AF engine, Nikon Multi-CAM 1000 autofocus sensor module with TTL phase detection, 11 focus points (including one cross-type sensor). Metering: No change here, Both uses same metering method & sensor, TTL exposure metering using 420-pixel RGB sensor. ISO range: Nikon D3200 offers better ISO range compared to Nikon D3100, you get standard ISO range up to 100 to 6400 and expandable up to 12800. Continuous shot: 4 fps shooting mode, better than the Nikon D3100. Video: Nikon D3200 features improved video mode, you get Full HD recording @ 30,25, 24 fps and HD recording @ 60, 50 fps. Nikon D3200 also offer manual control over shutter speed and ISO sensitivity before starting recording. The Video length / record time is also improved, you get Continuous capture / shooting time of 20min, 10 extra minutes compared to D3100. Display: Nikon D3200 have 3″ High resolution(921,000 screen dots) display with 160° viewing angle. Battery life, weight and dimension of Nikon D3200 is almost same as Nikon D3100. Price: You have to pay $150 more for buying Nikon D3200, Nikon D3200 available at $699 at Amazon (see buying details at the end) and Nikon D3100 available at $549 at Amazon. NEW FEATURE: WU-1a Wireless Mobile Adapter , for remote shooting and sharing files. Conclusion: we highly suggest that you purchase Nikon D3200, Nikon D3200 is an excellent entry level DSLR available under $700. for current D3100 users, you should upgrade your DSLR if you want more megapixel, fast image processor, improved ISO range, better video mode and wireless sharing and shooting option.